Bernie Pleskoff has released his Top 50 Prospect List and the Cincinnati Reds find three of their prospects on it. Over at Clubhouse Corner the former Major League Baseball scout, turned prospect writer and podcaster, released his list over the weekend. 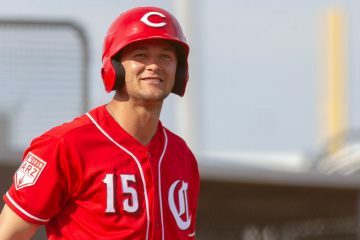 Nick Senzel tops the list for Cincinnati. 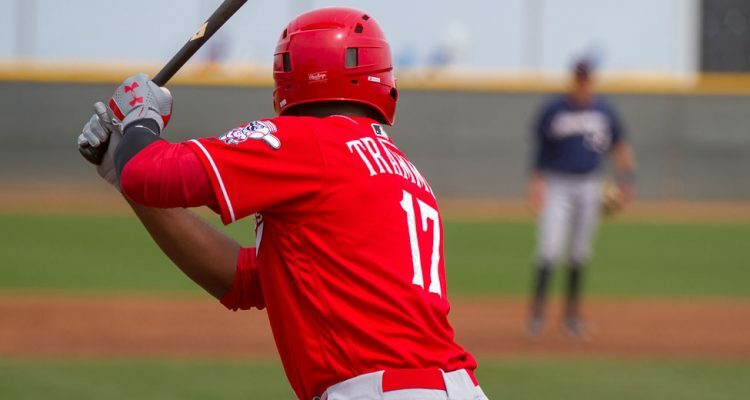 The Reds, well – we don’t know what position he’s going to play just yet – top prospect, came in at #5 overall on the list. Pleskoff notes that “he should hit plenty of long, long home runs in his home park in Cincinnati”. He’s also not ruling out that he winds up in center field this season. 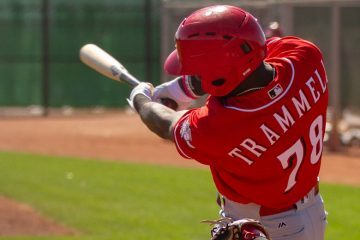 Taylor Trammell comes in a few spots further down the list at #13 overall. In the writeup for Trammell, Pleskoff noted that he reminded him of Michael Brantley, but with speed. It took Brantley a bit of time to come into his own at the Major League level, but once he did, he turned into an All-Star caliber player. In 2014 he finished third in the American League in the MVP race after hitting .327/.385/.506 with 15 steals. Hunter Greene wraps up the Top 50 list for the Cincinnati Reds. The 19-year-old right handed pitcher came in at #42 overall on the list. Pleskoff didn’t have full writeups beyond the top 20. For the rest of the group he just made one comment about the player, noting on Greene that he’s not as bullish as some. This is another good showing for the Cincinnati Reds on the national prospect list scene, so-to-speak. It’s also another good look for Taylor Trammell. While he hasn’t yet cracked the top 10 anywhere, he’s been close on more lists than he hasn’t at this point – with his low ranking coming so far at #33 on the Baseball America list. Doug keep on pumping out the quality content. You have been on fire. I find it interesting that he thinks Trammel will be in the show by the end of the year. I guess it’s possible, I just don’t see it happening. If he’s tearing it up in AA (or AAA by later in the year if it’s a big year) and there is a need for a CF in Cincinnati on a contending team, I could see it. Not the likeliest of scenarios, but you don’t have to squint too hard to see it. He’ll turn 22 in September. This is nice recognition. But, that and $2.00 gets you a cup of coffee at 7-11. Hunter Greene is taking one hit after another in these pre-season rankings. This year should tell us something on Greene, whether he can recover and move back up, or if he is on the same road to oblivion as Robert Stephenson. Keepers: Senzel, Trammell, Santillan, TStephenson, Mariel Bautista. Prospect Capital: Greene, India, Siri, VGutierrez. Maybe I was having a blonde moment. What makes Tyler Stepenson and Mariel Bautista keepers over the other guys? For Tyler, I would think, he is the closest to being MLB ready. If he do not get and extend JTR, may be needed. I do disagree on Hunter, I think he is a keeper. If we were to trade for Realmuto and include Barnhart in that package, i’d say it be crucial we hold onto T Steph. He’ll be ready in about 2 years, and Realmuto is only under contract for 2 more years and he will almost assuredly test the FA market. Siri is a keeper. He’s not worth enough in prospect capital in a trade to warrant missing out on how amazing he could become. For some reason he has fairly low value and prospect ranking, mostly due to injury IMO, maybe about the same value as Jeter Downs had. He’s already started to break through this offseason. He has a real chance to be the best outfielder the Reds have in majors or minors. My keepers are Senzel, Trammell, Siri, and Mariel Bautista. I’d like to keep Greene and Santillan as well. I’d personally put Greene as keeper too due to extremely high ceiling. Both have upside, and if we can get a #1/#2/#3 starter out of either of them, now we’re looking at a cost controlled impact player for many years which we transform how far this team can get. This is more valuable than anything that could be traded for other than an existing #1 starter with years of control or trading for another high ceiling starting pitcher prospect like Forrest Whitley or Gore, which just isn’t going to happen. Greene and Santillan do have some significant value while also some risk, so it’s a hard choice with any high ceiling starter pitching. IMO keep them as we need starters more than anything anyways to get over the top. Greene also has #1 starter potential which I don’t think Santillan quite has, so I think you have to keep him. I think India will have a big year this year, so it might be best to keep him and let him increase his prospect value even further. But, if you can get an extended 4-5-6 year Realmuto for him, then I guess you have to do it. Plus, his value is high enough already but that depends entirely on each team’s individual value as some may be really high and others moderately low. Likely the Marlins is high due to Florida background. Prospect capital: Mella, Gutierrez, Aquino, Stuart Fairchild, Hendrik Clementina, Andy Sugilio, Jimmy Herget, T.J. Friedl (might have more value as reserve outfielder though than limited prospect value), Miguel Hernandez, Mike Siani (might be better to wait for him to increase value), Lyon Richardson (might be better to wait for him to increase value), and Jose Garcia (might be better to wait for him to increase value). Big difference and different risks between Stephenson and Greene. Greene had a sprained ACL last summer. Stephenson has never had injury concerns. Stephenson has major control problems. In June and July Greene walked 2.14/9 IP. I am not sure how these two are comparable. I would never trade Siri. His trade value is minimal and his ceiling is top 3 in the Reds system, and behind only Greene for me. Bautista is old for Rookie ball and I have seen far too many players star in Billings and flop in Dayton. That said no way I trade him because like Siri his trade value is minimal and I think his K% translates well to Dayton. With Bautista, Siani, Juan Martinez, Drew Mount and Miles Gordon all potential everyday players in Dayton it will be interesting to see how the playing time is divided there. In 2013 Bob Steve walked 2.34/9 in Dayton with a K rate of 11.2/9. Stephenson had shown levels of control before, which makes me scratch my head why he seems to have little regard for it in more recent years when asked in interviews. Maybe just being defensive? His evaluation of Nick Senzel is very interesting. He acknowledges that Senzel has a good hit tool and a good power tool, but he seems to be more enamored with the power than hit. Granted, he does point out that GABP is a homer haven, but still. Senzel hasn’t really been portrayed as a power hitter as much as he has been portrayed as a contact hitter with great plate discipline. Looking at his homer numbers, he’s hit 27 in 231 career games, which would average out to about 19 home runs in a 162 game season. Balls fly out in the majors (due to the balls used), so that could potentially jump to 20 to 25 as he matures, but projecting anything beyond that seems overly optimistic, no? I agree Hab. At the plate Senzel reminds me of Votto. Both had about .200 ISO at Louisville. Both had .380 OBP. Both had about .880 OPS. Both had 20% K%. Votto beat him in BB% (12%/10%). Senzel did show more power without a drop in contact rate in June (.226 ISO, 17.5 K%) so if you project June over the next several months you can argue about the power here. Where Senzel separates himself from Votto is away from the plate where Senzel will be an asset at much more difficult defensive positions. The vertigo scares me but if he can stay on the field we have something really special here. Votto, Suarez, Winker, Senzel. We have half a lineup that should just straight wear starting pitchers out. Schebler isn’t bad at that either. Duke I don’t think we should forget Puig. The way he hits right-handed pitching he might be the power guy and if Schebler can’t play center he might not see much of the field. Not forgetting Puig, just pointing out guys who will walk a lot and see a lot of pitches. Puig doesn’t have a bad BB % by any means, just not quite like those listed. Puig plays every day. Schebler is the odd man out if Senzel gets CF at some point, but i’m not convinced that happens yet. For sure won’t happen opening day, and I could see it not happening until June/July. Projecting Major League home run totals based on minor league home run totals is not a good plan. Guys mature, physically, and mentally – and that changes a lot of things. Ballparks matter, too. Daytona, Pensacola, Louisville – not exactly known as home run friendly ballparks. https://www.baseball-reference.com/players/o/o%27neipa01.shtml Paul O’Neill is an example. Never showed too much power in 6 seasons of MiLB play but blossomed as a Red and exploded as a Yankee. How many more of these lists are there? Thank goodness Spring Training starts soon when something really matters. There’s only one left to talk about, John Sickels list. He’s currently without a place to publish, but apparently he knows where he’s landing but it won’t be for another week or two. Fangraphs still hasn’t put out their overall list either. Ah, yes. That one is worth looking at, too. I’m leaving Feb 22. I’ll be at the Feb 23 Reds vs Indians game in Goodyear. Bouncing around Feb 24-27 to see Reds, White Sox, and Brewers. The Brewers christen their new ST facility on Feb 26. Hopefully I’ll get to see Reds young players during the first week of ST.
Don’t think many will get there until the end of the first week of March. Their camp and games begin later though a few will be around. The Reds will have more than 60 players in camp by Feb 22. I’ll see them Feb 23 and 27. The first week, most teams play 30 or more players in a game.